In an ERA, in the Claims Paid grid, right click a problem claim. Select Add Tracking Status. If a claim on ERAs has special circumstances, you can add the claim to the Outstanding Insurance Claims Report with a custom tracking status and error code. Note: If a matching claim is not found, you will be asked to manually locate it. See ERA Match with Claim. Select the Custom Track Status. 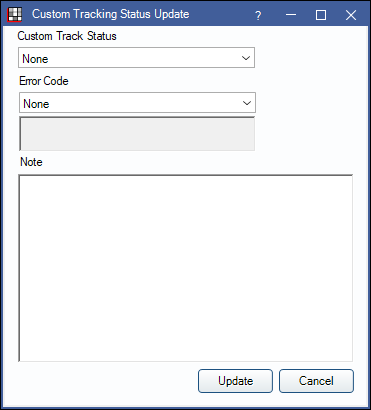 Customize status options in Definitions: Claim Custom Tracking. Select the Error Code. Customize error code options in Definitions: Claim Error Code. The claim will now appear on the Outstanding Insurance Claims report and will be detached from the ERA.